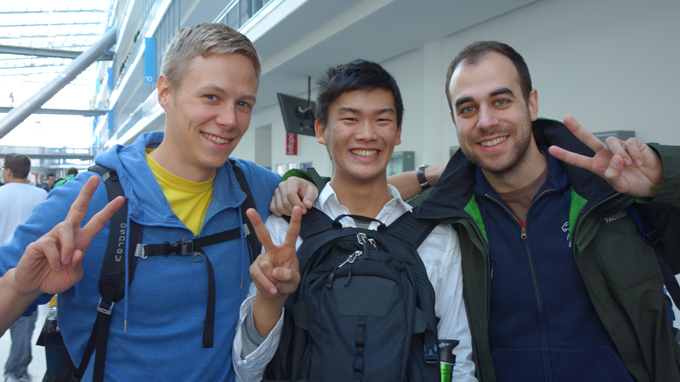 All about studying at the TUM and living in Munich for international exchange students. This goes from the selection of courses, learning German and the administrative as well as practical support from other TUM students to housing search, excursions and cultural program. International exchange students at the welcome event. International students coming to TUM from a partner university via one of our exchange programs or bilateral agreements are called exchange students. These students benefit from a simplified application and enrollment process, and in general they can attend lectures from all TUM departments. The Physics Department has a number of partner universities in Europe through the Erasmus program and elsewhere in the world through TUMexchange. You have to study at one of our partner universities and apply there for an exchange program. The partner university selects students for the exchange program and nominates them for a stay at TUM via the web-based platform “moveonnet” (= eNomination). After an acknowledgement-email from TUM, the international office of your home university sends the application documents to TUM. Deadlines are May 15 for the winter semester or the whole academic year, and October 31 for the summer semester. More details can be found on the website of TUM's International Center. Please consider that our Bachelor program is taught in German and that most of our Master courses are taught in English. Depending on your selected courses, you have to provide proof of sufficient language skills in the respective languages of instruction with your application. We require a German and/or English certificate of at least CEFR level B1 at the time of the application. CERF refers to the Common European Framework of Reference for Languages. The maximal length of your exchange studies at TUM is three semesters. To enrol succesfully at TUM, you have to pay the semester fee (student union plus basic semester ticket) and show proof of your health insurance to our Welcome Office. Deadlines are August 15 for the winter semester and February 15 for the summer semester. Only students that have submitted all their documents on time are able to register for language courses (places fill up very quickly!) and obtain their student card early enough to gain access to all student services (basic transportation, cafeteria, library, internet, sports, etc.). To be enrolled in our Physics Department, you have to take at least 60% of your courses in physics. Thereof, consider well your choice of courses before applying. TUM course catalog is TUMonline. Following the path Fakultäten/Departments >> Physik/Physics >> Lehrveranstaltungen/Courses, you will find the courses taught in our department in the current and past semesters (check options on the upper-right corner). You can find more information about TUMonline here. or in general in our courses catalog. Please consider that our courses catalog contains currently offered as well as past courses. If a course has been regularly offered in the last years, there are good chances that it will be offered again. Exams always take place at the end of the semester, normally during the three weeks following the lecture period. If you have any time constrains, please discuss this directly with the lecturers within the first weeks of classes. Registration for the exams is compulsory and missing the registration period means that you will not be able to take the exams! Students finishing their degree at their home university can arrange directly with our research groups to work on a research project as a Bachelor's or Master's thesis during their stay. After finding a supervisor and a research topic in one of our reseach groups, you have to register your thesis. For ongoing research projects, you can find more information on the status page. A transcript is an official document containing the courses you have visited during your stay at TUM, including the respective amount of ECTS credits and grade you have achieved. You will only obtain a complete transcript of academic records at the end of your stay, if you registered for all your exams on time. Registering outside the registration period is not possible. Transcripts can be easily printed out from your TUMonline account. Log in and select "transcripts" in the "studies" column on your visit card. Select the option "print certificate" to generate an transcript of your academic records. It is an automatically generated document, valid without a signature. If you are not in Germany anymore, you may contact her per e-mail and provide her with a postal address – electronic versions of the document are **not** available. Please consider that it may take some time for the post to arrive to you or your home institution. The TUM Language Center offers more than 15 languages, including German language courses during the semester as well as tandem learning partnerships (see their special programs). International exchange students are welcome to join, but do register well in advance in order to secure a place. The courses are free of charge, but they fill up very quickly!!! Check also their intensive language courses taking place during the semester breaks. We are always looking for native speakers who are interested in presenting their own language and moderating a table. If you are interested, please e-mail us at: student-exchange@in.tum.de (Garching) or tumi@zv.tum.de (Munich, Weihenstephan). Campus Garching: The language café takes place every Wednesday from 3 to 5.30 pm at the Magistrale of MI building. You can find further details about it here. Campus Munich: The language café takes place every Wednesday from 4 to 6 pm at StuCafé Audimax. Campus Weihenstephan: The language café takes place every Thursday from 2.30 to 4.30 pm at geniessBar (Maximus-von-Imhof Forum 3, Freising). Every year in May all our international students as well as former outgoing exchange students represent their home and guest countries, respectively, at the International Day. This colorful event takes place in the Magistrale (big entrance hall) of the MI building. You can also get in contact there with other students and chat about countries, cultures and exchange destinations. This is a joint project from the departments of Infomatics, Mathematics and Physics. A great opportunity for international exchange students to get in contact with our regular students is through our fellow program. To find appropriate accommodation in Munich can be very difficult, especially in October when the semester begins and short-time accommodation is booked out due to the Oktoberfest. Exchange students from outside Europe can be offered a room by our International Center, whereas European students have to find something on their own. However, the International Center offers helpful tips and links to find accommodation (see their accommodation site for exchange students). The TUM Housing Search Assistance has published a booklet Finding a new home in Munich (PDF, 1,2 MB) containing the most important information you need to have when looking for a place to live in Munich. TUMinternational (TUMi) offers orientation weeks before the beginning of academic activities and regular meetings throughout the year. They also support you in administrative affairs (residence permit, enrollment, public transport, etc.) and offer you a cultural program to get to know Munich and its surrondings. Remember to register well in advance for the activities to ensure you a place! If you would like to take a student job to support yourself during your studies or experience the job market through an internship, there are several possibilities on Campus Garching and in/around Munich. In terms of research, you could take a student job e.g. either in a group of the Physics Department or at one of the Max Planck Institutes. Please have a look at the TUM black board or contact directly the professors in each institution (most of them do not publish their student job oppportunities). For advice on an internship in the industry sector, please do refer to the carefully selected information and contacts from the TUM Career Service. If you wish to continue your studies at the TUM, you must re-enroll before the start of each semester. You are officially re-enrolled once your student union fees have been paid in-full within the re-enrollment period. All students must pay the fee for the basic ticket as part of their student fees. You may also purchase the IsarCard Semester to have 24 hour access to the MVV network.